Tarot Reading - Know from Tarot Readers what the cards hold for your future. Tarot reading is much more than a form of card divination that can tell us about our past, present and future. It is also an incredibly effective method for self-exploration. Get your online reading from Tarot Readers for shedding light on the important life events and lessons, if we are to achieve personal growth and transformation. I am into Tarot card reading, angel readings, angel therapy, chakra healing, crystals and dowsing. Shaping your life through new age therapies: tarot, numbers, crystal ball, feng shui, color therapy, angel’s healing, reiki, pranic healing, creative meditation etc. Sunanda is a Tarot Super Achievers Award winner 2012 in India,also an angel card reader, a gifted psychic, vibrational healer, crystal healer, reiki master, dowser. I believe tarot cards are not only a tool for predictions, but a therapy. The seeker is given options to change the negatives into positives , improving their lives. Malati is a owner and Consultant at Guiding Auras. Being a clairvoyant and a professional Tarot, Numerologist and Vaastu consultant helping people for the last 14 years . 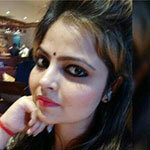 New Delhi based Tarot CArd reader, who belies in simplicity and keeping their clients life simple.